Well I’ll let you guess what I had for breakfast this morning… and yes you would be right it was porridge! For lunch I had a starter of grated carrot with a bit of ginger and a baked potato with a third of my can of baked beans. For dinner I decided to be a bit creative and made flat bread. So I took some oats and grinded them so that they became a bit like thick flour, I added a clove of garlic, a teaspoon of tomato purée and mixed it all together to make dough. 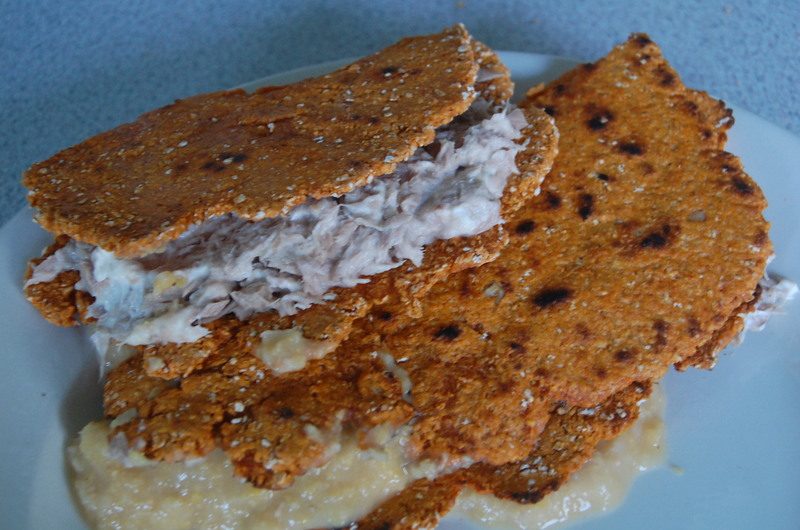 I made two fillings; the first was with a third of a can of tuna mixed with a tablespoon of cream cheese. The second mix was a simple hummus; I minced some chickpeas with some of its liquid (for flavour…) and a clove of garlic. Once I’d made these fillings I split the dough into two separate balls and rolled them out with a rolling pin. I then heated a pan and then one by one cooked the flat bread by putting it on the pan and flipping it over after a couple of minutes. Then I added a different filling to each and folded over. Not bad though I was definitely missing a big salad!